On February 27, 1964, after a hundred consecutive issues as a back-up strip, "John Jones, Manhunter from Mars" was escorted out of Detective Comics #326 using the device of The Idol-Head of Diabolu. 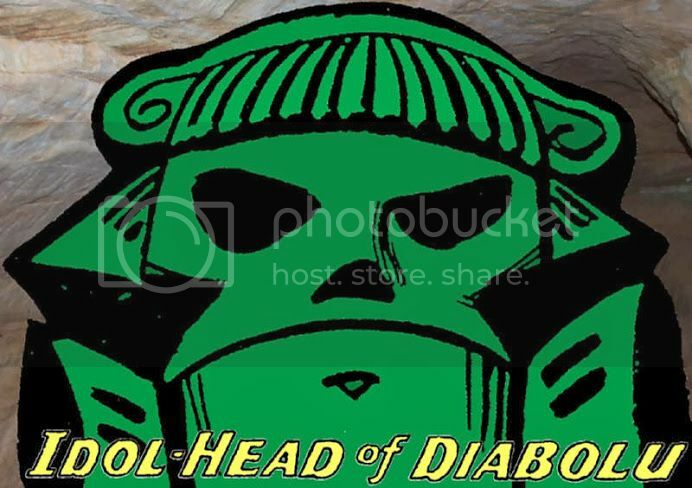 Created by writer Jack Miller and artist Joe Certa with the probable input of editor Jack Schiff, the Diabolu Idol-Head signaled a sharp rise in the tide of change sweeping across DC Comics. Despite a new wave of popularity in super-hero comics that had begun in the late 1950s, the Batman titles had continued to flail about, but would soon set a revitalizing course captained by Julius Schwartz with a host of fresh talent under the "New Look" banner. Schiff had already supervised a sea change for the Martian Manhunter strip, including more fantastic circumstances and the introduction of a pet/sidekick with other-dimensional abilities. However, the Diabolu Head would be the catalyst for the most radical departure, as the entire crew set out on a buoy to the anthology title House of Mystery. The idol-head was the creation of its namesake evil wizard in Ancient Babylon, into which were sealed a menagerie of supernatural menaces. A mere key was all that contained the threat, and once it was employed, the idol-head began releasing terrors on the full moon of each month. 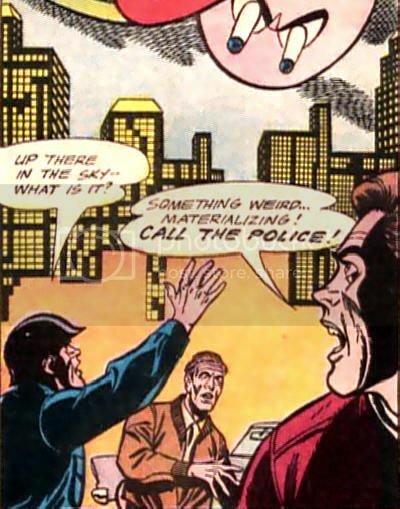 In its first story, a devouring cloud appeared to eat police detective John Jones, the human alter ego of the Manhunter from Mars. Despite no apparent means of locomotion, the idol-head had fallen from a dismantled shack into a canal and floated away to parts unknown, an ongoing contrivance. 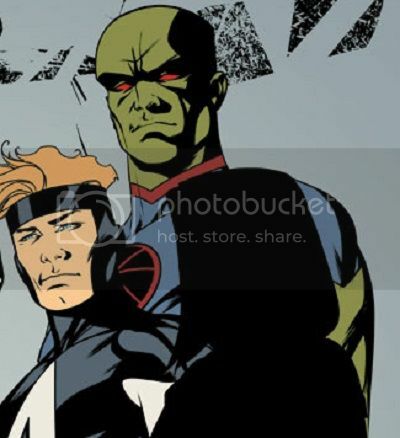 J'onn J'onzz decided to leave his human identity "deceased," and abandon his long time beat in the city of Middletown alongside Captain Harding and Patrolwoman Diane Meade to begin a lengthy search for the Diabolu Head. The premise created a demarcation point from the Detective Comics strip to House of Mystery, better fitting its new home, which specialized in short toothless stories that married The Twilight Zone with z-grade monster movies. Each month, the Alien Atlas and his partner Zook would confront bizarre beasts, weird worlds, and sinister sorcerers unleashed by the idol-head. 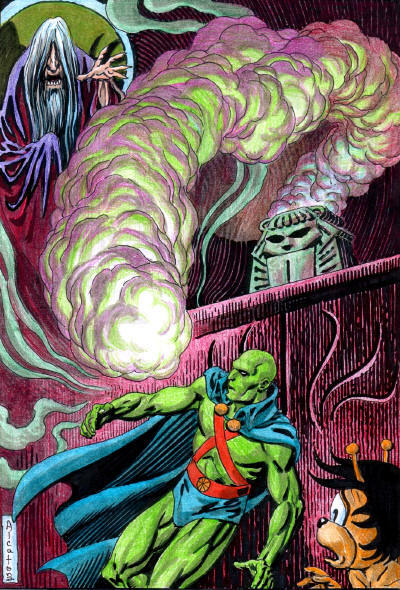 The Martian Manhunter was the cover featured star of the book for a short time, but his quest for the Idol-Head of Diabolu did not raise sales sufficiently. After less than two years, an origin story for the idol-head proved to cover alpha to omega, as the artifact was finally destroyed at the end of the tale. Zook mostly disappeared, and yet another bold new direction was taken. 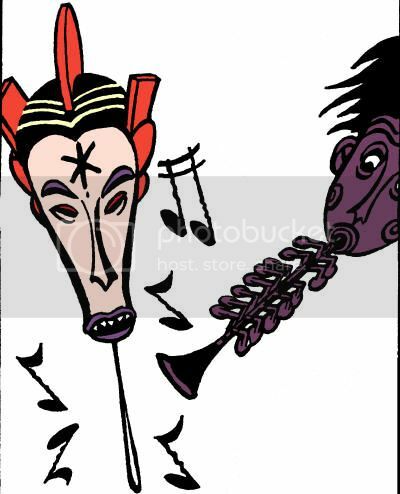 The Beings in the Idol-Head! Secret of the Purple Prose! The Fan-Thing That Unearthed Fiction! According to The Book of Diabolu Legends, "Beware the Witch Doctor's Tomahawk of evil." It was secretly buried upon the Witch Doctor's death. "Whoever shall unearth it will release his tribal ancestors upon a warpath once more..." While the tomahawk was sought by the creature forms of the idol-head afflicted “Driftwood” Dagan, it has not yet been recovered in a recorded incident. While taking in a run along an unidentified city's shoreline, beachcomber “Driftwood” Dagan saw the Diabolu Head bobbing in the water. As soon as Dagan picked it up, he was struck by energy released from the opening lid of the idol-head. 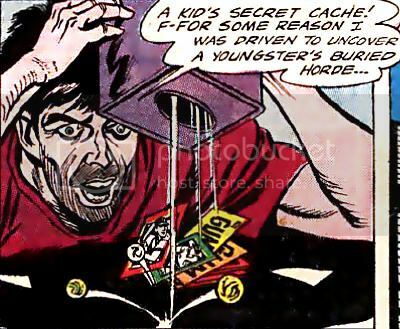 Dagan turned into a human-sized mole, dug up a child's buried treasure, then reverted to human form. Panicked, Dagan ran into the city for help. Again, he transformed into a furry mammal, this time with a steel screw power drill for a nose. After it bored a "time scroll" capsule out of the corner stone of a building, the restored Dagan was arrested by police. En route to a mental hospital, the frustrated and angry Dagan turned into a large condor-like creature whose feathers burst into flame when they separated from its body. The bird escaped, recovered a bag of stolen loot, and evaded the pursuit of the Manhunter from Mars. Consulting The Book of Diabolu Legends, the Manhunter determined that this man-thing that unearthed secrets had been created to find the Witch Doctor's Tomahawk, but some unknown force had altered Dagan's programmed imperative so that he instead dug out any treasure that crossed his path. This included a secret underground government depository, which Dagan was compelled to raid as a winged caterpillar. An encounter with Zook nearly caused Dagan to drop gold bullion bars on the heads of defensive National Guardsman, if not for the intervention of the Alien Atlas. Dagan made his way to the mountain area north of the city, where he turned into a giant weasel and invaded the cave hideaway of Martian Manhunter and Zook. Dagan briefly resumed human form, then transformed into a worm to locate a facsimile of the tomahawk. The Manhunter from Mars had planted it with the intention of halting Dagan's changes for good. The plot appeared to be effective, though Dagan was not seen again for confirmation. It is unknown whether Dagan was held responsible for his unintended crimes. Quote: "Please... you must listen to me... Some terrible force turned me into a creature and made me dig this out!" The people of the other-dimensional Disc World appeared as mildly anthropomorphised circles roughly the height of adult humans. 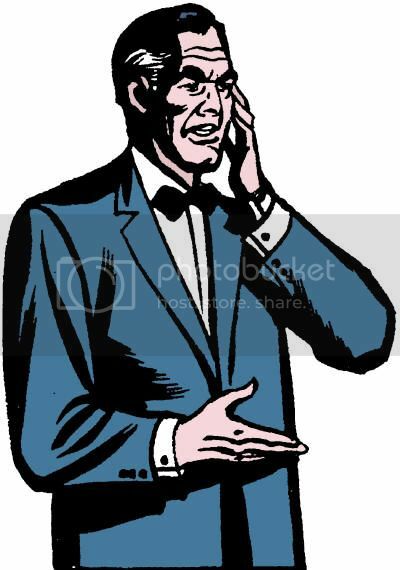 They had large, free-floating cartoon eyes and brows, as well as approximations of arms and hands as needed. The Disc World people appeared to hover a foot above the ground as part of their natural locomotion. The representatives of the world seen to date have been aggressive, with soldiers poised for invasion. According to the legends of this colorless people, one day they would acquire access to color which would empower them to exist and thrive on other worlds. "The Great Color-Ring Spirit," eventually appeared on Disc World, not coincidentally at the same time the Diabolu Head opened for the seventh time on modern Earth. This Color-Ring Spirit created a warp between Earth and the Disc World, then began capturing flatly colored objects from the city of Bedford. Through a curious contraption, the Disc people extracted a specific color from said object, which appeared to take on a liquid form. This liquid could then be absorbed by the Disc World's citizens, which would grant them powers. Yellow rings could create energy bolts that destroyed targets with a blinding flash. Blue rings could "bring inanimate objects to life!" It seemed that either the red or green ring could manifest figments of the imagination as a thoroughly convincing, overpowering entity in the mind of a given victim. In the case of the Manhunter, this power was demonstrated by his fantasy of battling a two-headed octopus type creature strong enough to contain even his Martian muscles. The illusion faded when the Spirit no longer required the distraction. It is not known what the unrelated ring (whether red or green) could do. All colored rings on the Disc World and beyond appeared to be able to fly. 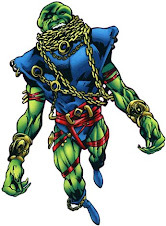 The Color-Ring Creature was spawned under a full moon, but began its thefts in downtown Bedford City at dawn, attracting the swift attention of the Martian Manhunter and Zook. "The Great Color-Ring Spirit" was a pink circle as opposed to a ring, and its eyes rested on stalks. 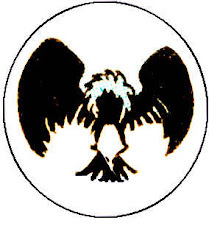 It soon merged with four initially colorless rings which acquired chroma and powers through the theft of earthen objects. 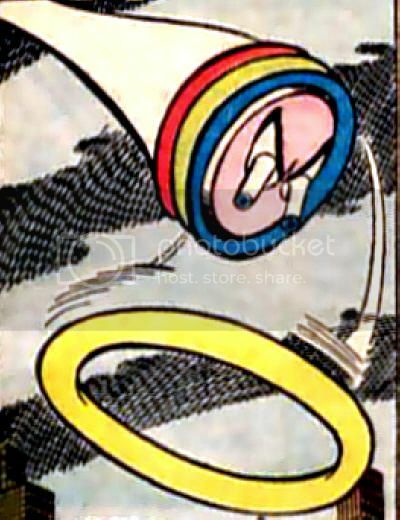 An individual ring would separate from the Color-Ring Creature, commit a theft by absorbing an object, transporting it to Disc World where it was stripped of a color, then returned to Earth via a rejector device. This process would repeat until each ring was sufficiently filled with color to empower the Disc Soldiers to invade. 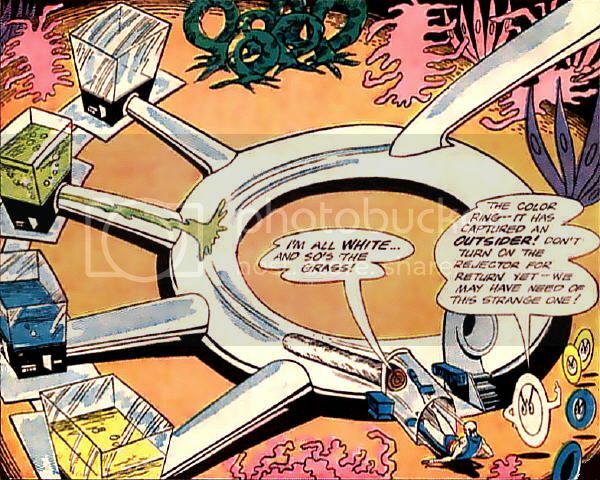 However, the Martian Manhunter and Zook allowed themselves to be captured, sabotaged the machinery on the Disc World, and returned home before the Color-Ring Creature vanished from the Earth. Bedford City is a major metropolitan area nearby Middletown, the location of the sealed mountain hideaway of the Manhunter from Mars and Zook. Its skyline was covered with high rise buildings, as well as new construction. It was home to a waterfront and the Rainbow Paint Factory. Its streets were bustling with citizens and modern automobiles. While nearby Middletown was a hotbed of supernatural activity, Bedford City only faced one recorded menace, the Color-Ring Creature released by the Diabolu Idol-Head. 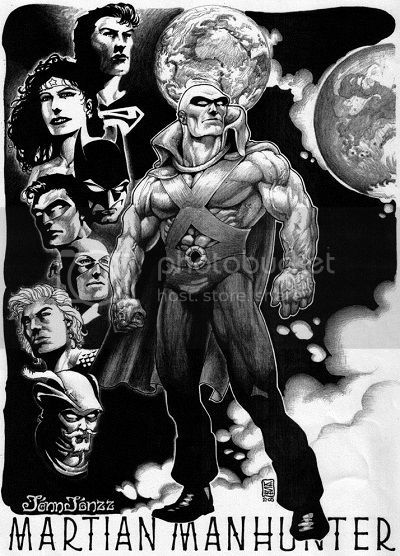 "Martian Manhunter -not much change here, I had Stormwatch in mind when doing this one so no cape, however when he does need one the blue part morphs into a cape and the collar flairs out. 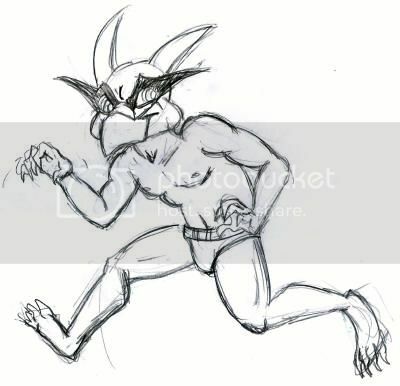 I chose to drop the suspenders and make a belt, without the cape it looked too much like an X-Men costume"
Also Known As: "The Musical Creatures"
From the cliff side where Aroo had left the idol-head, a sixth full moon meant Diabolu would spawn another menace into the modern world. Diabolical flying musical instruments made their way to a city square after following their maestro's order to tune themselves in preparation to play "The Arms of Morpheus." The weird melody caused bystanders within earshot to immediately fall asleep. The heroic Manhunter from Mars and his dimensional friend Zook rescued the humans from the calamities that followed their sudden slumber. 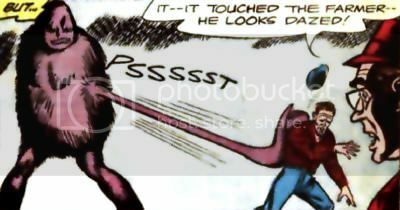 Although the aliens were not affected by the eerie music, the orchestra of music creatures were able to create a supernatural sonic barrier against aerial pursuit by the Martian Marvel. The instruments then faded from view. Hours later, the Orchestra of Evil rematerialized south of the city, playing a new melody that caused citizens fits of hysterical laughter. Local hoods stopped up their ears and attempted to use the mayhem as a cover for robbery, but were captured by Martian Manhunter and Zook. The Doom Band again faded out, but upon their reappearance, split up to stage "concerts" in three separate parts of town. 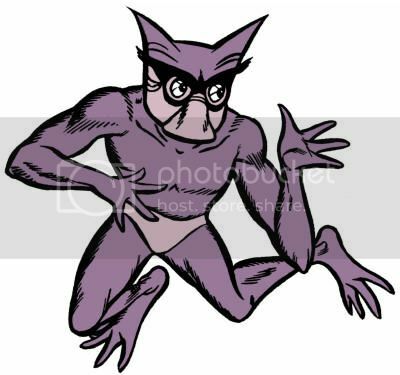 The purple flute creature cracked the tower of a northern building before fleeing Zook. A duet of musical creature strings (cello & violin) created "sound rails" that tracked a train up into the sky, only to stop the music abruptly. J'onn J'onzz rescued the train, but was too late to address the fading strings. 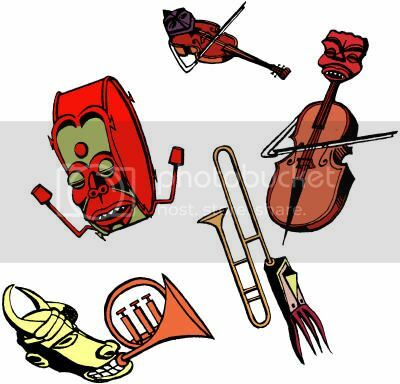 A quartet of musical creatures at the city park; including the maestro, the drum, the French horn, and the cello; caused a violent riot. This time, Zook fell under their influence, but was released when the Orchestra of Doom were driven off by a rival human band in the park. The following day, the bizarre orchestra hovered over the harbor district at full strength, causing boats to crash into one another. The Manhunter from Mars soon arrived to function as a one man band. 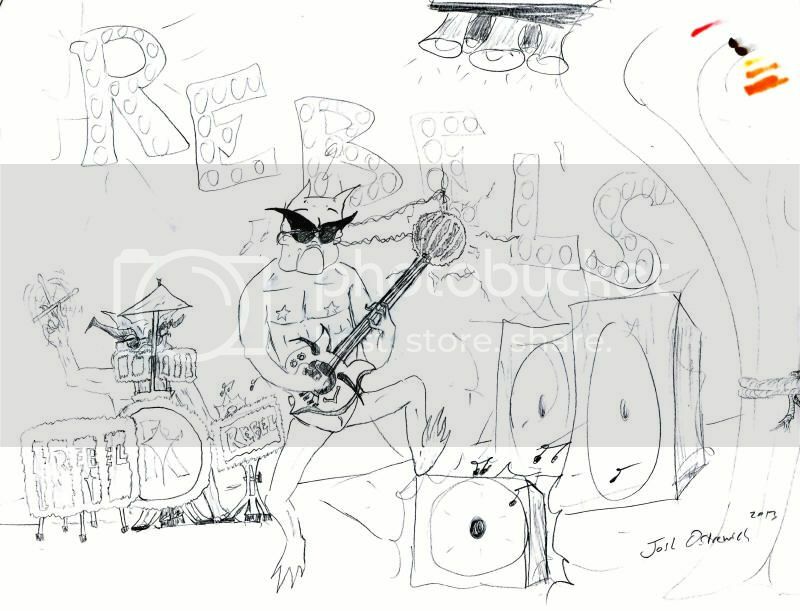 While the musical creatures had been exposed to a variety of music during their rampage, their shrinking from the park indicated their vulnerability to the song "Last Rose of Summer." J'onn J'onzz played out the musical creatures with the tune, trapping and disintegrating the lot. 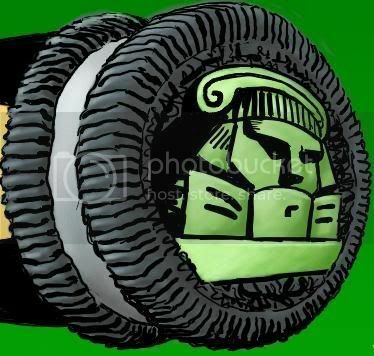 Quote: The Green One again! He has learned our weakness-- the music... we cannot stand it!" Even at "half-style," McKone's take on the Alien Atlas has me looking forward to picking up this trade. That cannot be the final coloring, though. While I find modern coloring a bit busy, I also recognize that this looks to have been done by an editor using fills in MS Paint. I do do this for Vile Menagerie entries, y'know. As with the final issues of Justice League of America, the foregrounding of Stargirl over J'Onn J'Onzz makes it easy to toss this into the "read whenever" pile. Solid stories underrated in the shadow of Morrison/Porter, and of special interest to Martian Manhunter fans is the "Terror Incognita" arc. J'Onn turns up in #6. Features JLA analogues, including Stalker. Your Martian Manhunter blog's current slowdown in production has in part been brought to you by a double shift, mild illness, and the prospect of having to cover the Orchestra of Doom. Mostly the last one. You may recall that Ryan "Count Drunkula" Daly of the Black Canary blog Flowers & Fishnets already cast his own "Justice League movie" heavy with Martian representation here, but he also took the time to expand that into a full solo Sleuth from Outer Space feature film. Besides Dolph Lundgren as Mongul and Sam Neill as Gorilla Grodd (which I can roll with, as seen in his Superman & Flash movie castings,) Daly has also given us some b-side album cuts from the Alien Atlas archives! I thought Daly had picked Michael O’Neill for Captain Harding because of his similar role on Monk, only to find out that was actually Ted Levine. How good of a detective could Adrian Monk be when Buffalo Bill was right under his nose the whole time? Daly originally offered Battlestar Galactica alums Katee Sackhoff and Tricia Helfer as Diane Meade and Cameron Chase, but then flipped them on account of my whining. I approve of Daly's inclination to cast people of color as characters of non-terrestrial color, but Freida Pinto seems kind of Mrs. for the more girlish Miss Martian, plus M'gann's affecting classic traits of earthly redheads skews her that much further away. Back before Don Cheadle blew up, I listed him for DEO Director Bones. Jeffrey Wright would certainly be a swell replacement, unless that Hunger Games bread goes to his head. Nina Dobrev's Gypsy is also in the mix somewhere. William H. Macy is certainly an inspired Professor Arnold Hugo, and I really ought to get my own options down around here. I had Anthony Perkins for the fake 1966 movie write-up that I never completed, someone else in mind for the ersatz Smallville spin-off "Middletown" that I stalled out on, and a third possibility for a major motion picture. Blast my backburner! Tom Sizemore is a big ball of blue collar crazy, so he could certainly pull off the Human Flame. Franco Nero might just euro-up Dr. V to the correct degree. I'd have never thought of David Morse for Doctor Trap, but he's perfect, isn't he? Michael Wincott is a go-to evil dude in movies, and he offers an extremely nasty, distinctive voice that, praise be, isn't Keith David's. 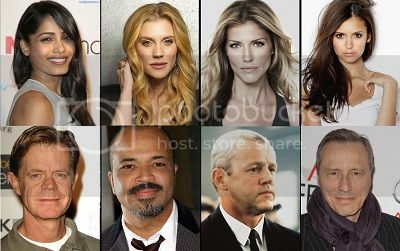 It occurs to me that most of these actors are TV heavy on IMDb. Wouldn't this make a snazzy show? AMC? HBO? Anybody? Check out the Comrades of Mars and Vile Menagerie casting sheets for more! Also Known As: "The Doom Shadow"
When the idol-head released the mighty Aroo, it set in motion a prophesy from The Book of Diabolu that "The Doom Shadow will follow..." A giant glowing spotted egg was secreted in a cave in the United States, origin unrevealed, and was preparing to hatch. Aroo protected the egg from flooding after a dam burst, and safeguarded it from the investigators Martian Manhunter and Zook until it finally cracked open. Aroo turned transparent and faded away, his final fate unrevealed, while the Chulko began its rampage. 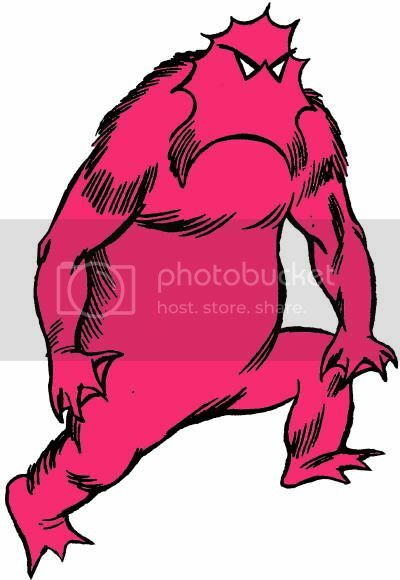 The Chulko was a large anthropomorphic being of unclear composition, although it appeared to combine mammalian fur with reptilian webbing/fins. It caused damage to the region of farmland near where it hatched, and showed neither a regard for life nor a clear, mindful purpose. 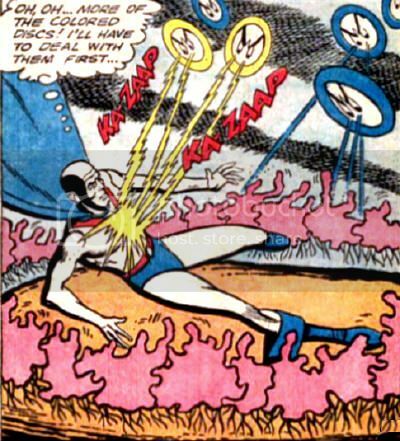 The Chulko managed to temporarily strip J'onn J'onzz of his powers and even basic locomotion with its eyebeams before being destroyed by Zook. The Chulko is best remembered for its "Doom Shadow." Essentially, anything that fell under the shadow of the Chulko became petrified. The Chulko could also fire paralyzing rays from its "evil eyes," which effected everything from machinery to Martians. The Chulko was fatally vulnerable to water, which caused it to fade away. For the fifth time since its activation in the modern era, the Diabolu Head spawned a new menace. The mighty Aroo not only tangled with the Manhunter from Mars and Zook, which was common practice by this point, but was also exceptionally proactive in safeguarding the idol-head and its mission. After briefly cowing the Alien Atlas, Aroo recaptured the Diabolu Head from Zook, who had been trying to destroy it through his temperature controlling powers. Even though the heroes had managed to follow the idol-head from Cairo to the United States within the span of a month, Aroo hid the artifact so thoroughly that it could not be found domestically before reopening. 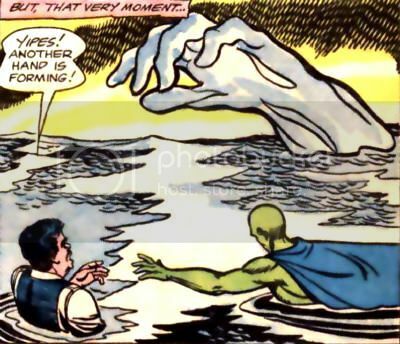 Aroo protected a giant spotted egg from which the "Doom Shadow" would eventually emerge for numerous hours before again facing the Martian Manhunter. Once the Chulko hatched, Aroo became transparent and faded away. Whether this was a demonstration of Aroo's power or Aroo perishing after its mission was completed is not known, as it has not been seen since. The mighty Aroo had two antennae-like funneled protrusions from its head. The right side fired a destructive energy beam, potentially electrical in nature, which could strike with lethal power and carve out the earth in its wake with ease. 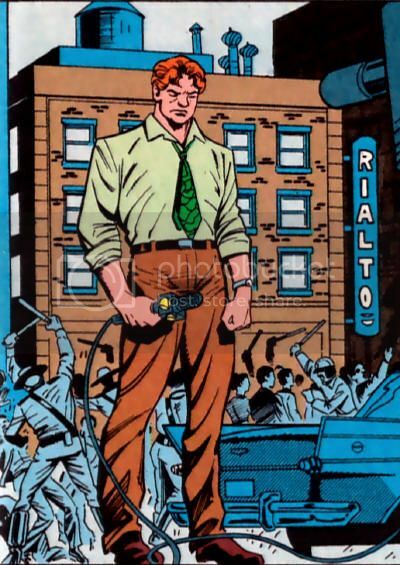 That energy was ineffective against a Martian, but Aroo's left side was a flamethrower, which proved more potent against the Manhunter. 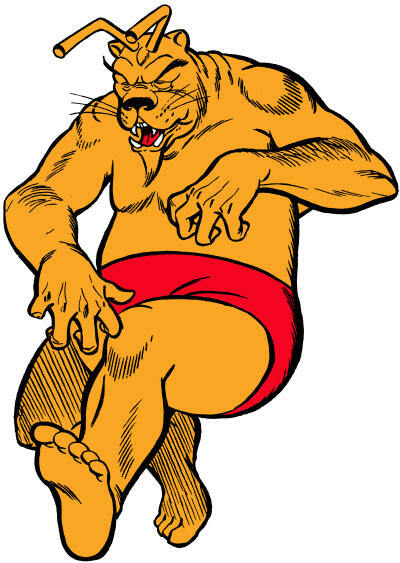 Aroo could fly, and was extremely resilient. Quote: "You will have to destroy me first, puny being!" While Kaleigh “Kalo” Hvizdos was working on a Venomee commission, her boyfriend Josh got bored and decided to do one of his own for free! Two of the three Venomee pulled a White Stripes, complete with a shrinking electrical cage ax, star-shaped pasties, and sunglasses over their eyelashy-thingamajigs. There's a lot of fine details in there, so check them out! 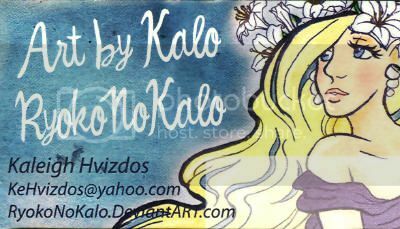 Returning for more Awesomest Alien Atlas Art Anytime commissions from last year, here's a piece by Kaleigh “Kalo” Hvizdos featuring one of the niftiest threats to spring from the Idol-Head of Diabolu. The Venomee where a trio of creeps in search of rare materials in the middle east who did battle with the Sleuth from Outer Space and Zook. They turned up very briefly in my fake 1967 The Superman/Aquaman Hour of Adventure: Manhunter from Mars Segment Intro that some folks amazingly fell for (they're the fleeing silhouettes spied with Martian Vision.) Like an animator, “Kalo” actually did two drawings of the Venomee-- a layout sketch, and then the full colored finished art manually reproduced on tracing paper. I've never had anyone do that on a commission before, and it's neat to have this artifact of the creative process. It's also like getting two pieces in one, though technically I got three, but we'll get to that this weekend. The Venomee were just a bit darker and creepier in the comics, so I like to think if there really were a cartoon, this is how Filmation would have adapted them. Brighter, cleaner, more colorful, and with a stronger sense of being "on model." I especially like the firm beak and the crisp, exaggerated eyelashy-thingamajigs. I'm planning to get some more of these weirdies this year, so I'll hopefully get the chance to ask Kalo for another! For more work from the artist, check out her deviantART gallery! I was off work today, but I agreed to a couple of early bird days starting tomorrow. After my usual exceedingly long reply to the latest Who's Who Podcast, I was all like "blogging is for losers" and caught up with True Detective instead (it finally gets moving with episode three.) I knew I needed to knock something of little depth out as quickly as possible, but still bothered to check my neglected "official" email. Lo and behold, one of our readers had sent me something that fit my needs. I don't know if Alexi is a public figure (seems likely per Google, but still) so I won't use his full name, but he alerted me to the fact that the Alien Atlas was finally going to get the Lego Minifig treatment. Folks seem excited to finally complete the "Magnificent Seven" JLA in Lego form, though I hasten to note that this is the New 52 version, so you'll still have to wait for Cyborg. Before they came out with the large Avengers movie Hulk, they released him as a Minifig with a more '70stastic look, so I'm hopeful we'll get a Silver Age/Classic Manhunter from Mars at some point in the future. I do like the New 52 design though, and it translated very well to brick. 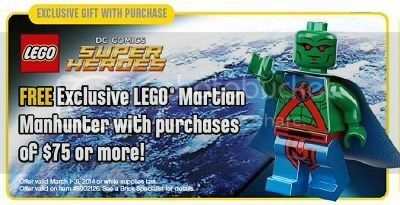 I am a tad perturbed that my Lego obsessed girlfriend managed to miss this, but since she's the one who'll be spending the $75+ to get the "free" toy within the month of March 2014, I can't exactly hold a grudge. Also, I put together a Lego B'rett with her spare parts a few years ago, which I really ought to photograph and digitally customize for the blog. Or not. We'll see. Read more about the Minifig here! In the third recorded instance of the Idol-Head of Diabolu unleashing evil in the modern era, a hole opened in the sky that forcibly transported people to the weird world of Gilgana. One such innocent found himself floating in a body of water from which a giant hand formed. A rescuing Manhunter from Mars dived to the rescue, and sand on his body from Gilgana caused an explosive reaction when it came into contact with the water. A new hand soon formed, but the Alien Atlas spirited the man away to land, then formulated a plan to use his discovery against Gilgana. In the third recorded instance of the Idol-Head of Diabolu unleashing monsters in the modern era, a hole opened in the sky that forcibly transported people to the weird world of Gilgana. One such innocent found himself pinned down in the sand by a large rhinoceros-type creature roughly the size of an elephant or two. 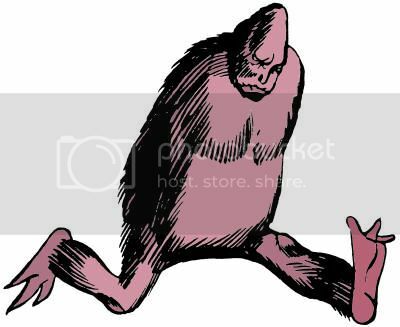 The creature had a horn approximately a foot long protruding from its forehead that it could fire like a rocket at least a hundred feet, then immediately regrow and fire another. While likely lethal to humans, the bony projectiles broke into pieces against the chest of a rescuing Manhunter from Mars. In a junk yard heap, at the full moon, a second menace was released by the Idol-Head of Diabolu following its activation by Vince Durskin. A strange pod wafted on the wind and settled into the rich soil of a farm. At dawn, this approximately twenty foot tall "seed creature" erupted from the grounds near a farmhouse and began lumbering about. Local authorities were alerted, and media carried the news to a radio in the sealed mountain hideaway of the Manhunter from Mars and his powerful pal Zook. Quoting The Book of Diabolu Legends, J'onn J'onzz noted "Man's fear will unleash its golden touch, and when its dark mission is completed, it will leave greater evil behind in its place." 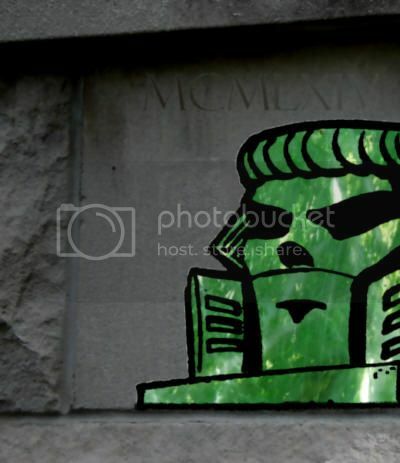 Flying to the farmhouse, the Martian Manhunter was dismayed to find a local man had fired a rifle at the "harmless" creature, activating its defenses. Where the creature had previously displayed no visible upper extremities, a single tentacle-type appendage stretched out to touch the farmer. Initially dazed, the farmer grew to giant size and began mindlessly attacking onlookers, damaging his own farm. While the Alien Atlas knocked out the farmer, Zook tried to tangle with the creature, but was touched by the tentacle. Zook grew in size and aggression, his body radiating such heat as to ignite nearby trees. While the Manhunter dealt with his maddened sidekick, the creature shuffled off, continuing its "dark mission." The creature fired its appendage a final time under a rock, then began to shrink into nothingness. "Great suns! It-- it expended the last of its energy on-- on a microscopic figure that's started to grow! It's completed its mission." The Giant-Maker had restored the sorcerer Malador, who began his own rampage until being stopped by the Manhunter and Zook. When Vince Durskin stole the Diabolu Idol-Head from John R. Collins, he released the first of its many menaces to plague the modern era. 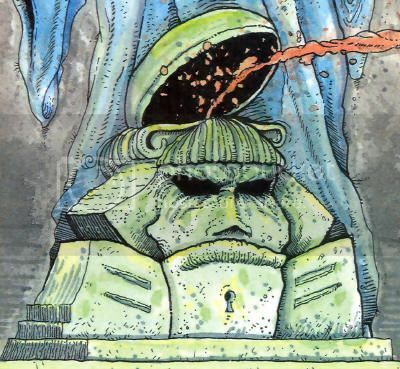 Durskin was impregnated with a supernatural energy that destroyed anything he gazed upon, then a "strange ominous form" emerged from the idol-head. This glowing cloud-like presence appeared to consume anything that it came into contact with-- small structures, train cars, a steel tower, and more. 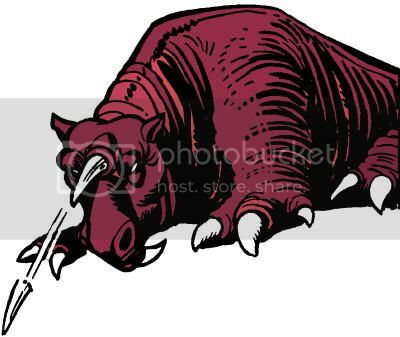 "The Voracious Monster" was absorbing anything in its path, triggering efforts from the Middletown Police Department to arrest its rampage. At a local airport, the alien hero Martian Manhunter "fed" the thing a fleet of airplanes that temporarily satiated the entity. The Manhunter had bought himself time to investigate Vince Durskin while in his secret identity as Detective John Jones, and work out a means to finish "that destructive glowing menace!" Middletown P.D. eventually located Durskin, but not before "that glowing menace" returned within the city proper, and nearly devoured a young boy before "John Jones" appeared to perish in his stead. 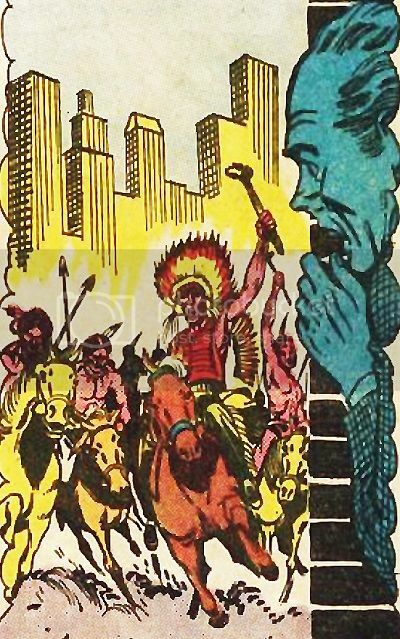 "The terrifying creature" turned toward the shocked and grieving Chief Harding, but the Manhunter from Mars had faked Jones' death with a plan of action. The Manhunter found Vince Durskin and forced him to use his destructive vision on "that glowing Diabolu menace." 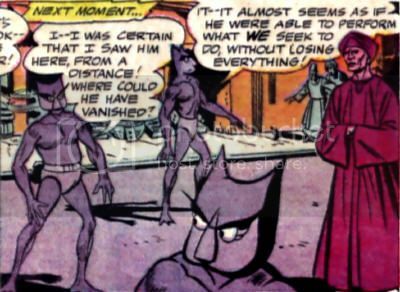 The figure vanished and Durskin lost his powers, while John Jones remained "deceased" to allow J'onn J'onzz his lengthy pursuit of the missing, activated idol-head and its menagerie of menaces. "2006 submission for San Diego Comic-Con souvenir book." 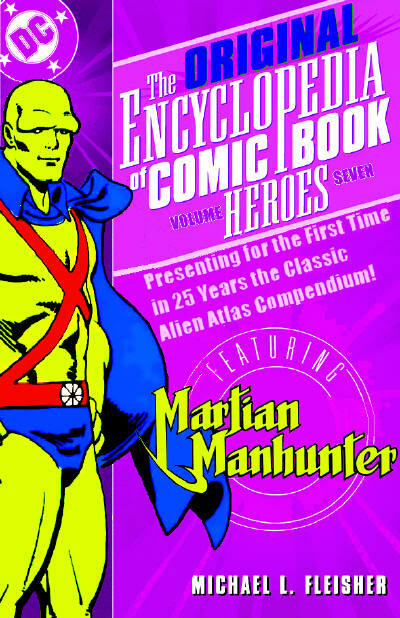 It was featured on page 47 in the program's section celebrating the 50th anniversary of the first published strip featuring J'onn J'onzz: Martian Manhunter. Per Twitter, Swedish artist Christopher Brändström has worked on "Concept Art for World War Z, 47 Ronin, All You Need is Kill, RIPD + more. 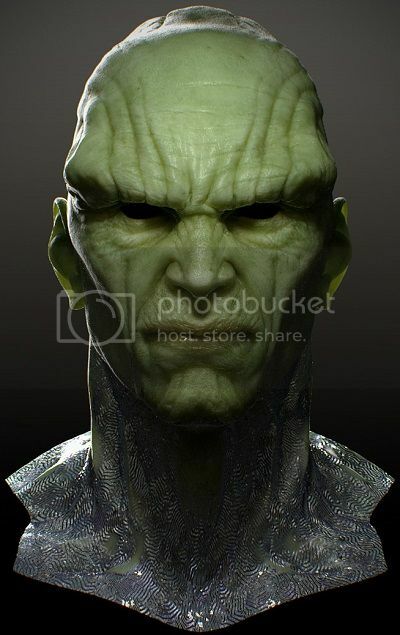 Zbrush junky and Freelance Character Artist for movie, commercial and game industry." "I don't know why, but the last two pieces have all been DC-characters. The last one I did was a 40s alternate version of The Flash Noir. I did acutally start on another version of Martian Manhunter a couple of years ago, but after revisiting it I wanted to start from scratch. So this is a render from Vray. I've been using Mental Ray for quite som time now but I thought I'd move over to Vray, which I feel I like better and better each time. So I'm still learning the ropes and testing the different shaders and so far it's pretty straight forward which is nice. I'm used to the mix8layer-shader in MR so it's nice to try out Vray's BlendShader and mixing it up! So this is just a test render so far. Not sure I'll be keeping any of it in the end." Brändström continued this "One Year Later" inspired modeling to a full (uncolored) figure, which you can see here, or progress to his site Badrobots for more of his work. Spencer Lee was raised in Wilmington, Alabama during the early 20th century, but moved to Denver, Colorado for a couple of years to pursue a career as a newspaperman. It was on this beat that he met police detective John Jones, who said of Lee, "He always seemed a little out of place. A real character, southern through and through... Used to hang around the police station, badgering me for story leads," and was "a persuasive son of a gun" Lee broke one story that "pounded city hall" over a development scandal, which ushered in a new administration more cooperative with the police department. Lee came to believe that papers were going to die out, and eventually returned to his home town for the opportunity to move into television news with WWIL channel 7. A smoker, Lee suffered a minor heart attack in the early Spring of 1963, attracting the attention of his old friend Jones. During a convalescent visit, news broke that an African-American church had caught fire, terribly burning a child named Mary Lou Wilson. Lee convinced Jones to investigate the matter until Lee was discharged from the hospital. When Jones turned up evidence of a cover-up by local and federal authorities, Lee brushed-off these findings. Lee favored his unnamed "sources," who asserted "The church fire was started by the colored community. Maybe an outside agitator was involved. They want to stir up the racial situation around here. Garner some sympathy and attention..." Lee was thrilled when his tiny station was scheduled to go national when "militant" blacks began matching through Wilmington. Jones asserted that they were peaceful demonstrators, but Lee dismissed his concerns. "Just do me a favor and don't tell me how to do my job." Lee was set to distort the conflict that followed under the brutal hand of local police until he was confronted by an angry John Jones, who manhandled and guilted the reporter. Ashamed, Lee finally spoke the truth for a national audience. Created by Pat McGreal, Dave Rawson, & Dave Cockrum. Little is known about the history of Vince Durskin before he stumbled upon the secret key of the wizard Diabolu and knowledge of its purpose. 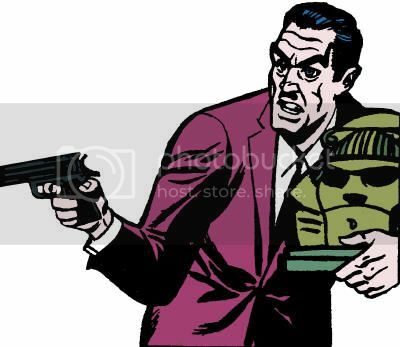 Durskin then broke into the home of John R. Collins to steal the Diabolu Idol-Head, the receptacle to be unlocked by the key, in hopes of finding rare jewels within. Durskin was confronted by Collins, who he held off at gunpoint before escaping with the idol-head. At a shack Durskin was renting adjoining a canal on the outskirts of Middletown, the thief unlocked the idol-head, and was immediately struck by a supernatural flash. Energy began to flow out of Durskin's eyes to destroy anything that befell his gaze, aside from a convenient pair of sunglasses Durskin found could contain his new powers. A voracious cloud-like entity was also released from the idol-head before it closed, demolishing the shack and progressing to wreck havoc in the region. Durskin fled from the force he had unleashed back to the metropolitan area of Middletown. 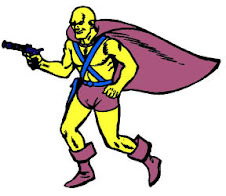 Though initially despairing his transformation, Durskin soon realized an opportunity to use his eye beams to rob an armored car. The theft was interrupted by the arrival of the local super-hero Martian Manhunter. While the Alien Atlas shrugged off the strike of Durskin's eye beams, Durskin was able to stymie the Manhunter by imperiling onlookers until he could slip away. Later, Durskin was tracked by police to a flat on Dey Street, but before he could be apprehended, officers were diverted to deal with the energy cloud. 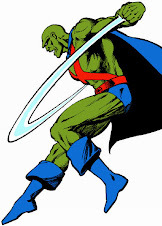 The Martian Manhunter had deduced that Durskin's new powers might be the key to stopping the cloud, and successfully applied the theory after apprehending Durskin. 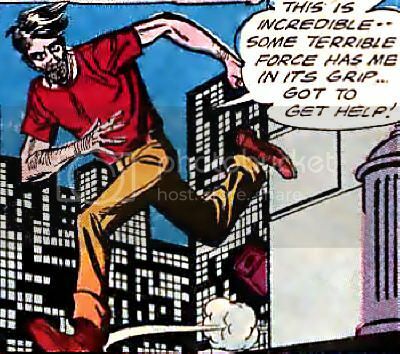 However, the Manhunter was forced to permanently abandon his secret identity as John Jones in the process. Durskin's powers vanished with the cloud, and he was turned over to the police. Vince Durskin's destructive eye beams appeared to bludgeon objects with great concussive force, as opposed to outright disintegrating them, but the process was not sufficiently explicit for certainty. Vince Durskin was described as having "a long scar down his left cheek" and having a "Hitler-type mustache." Quote: "One more peep out of you-- and it'll be your last!" John R. Collins was a collector of ancient artifacts, some of which he kept on display in his lavish home. At one time, his rare collection included the Diabolu Idol-Head and its companion volume The Book of Diabolu. The former was stolen by Vince Durskin, and the latter turned over to Middletown Police Detective John Jones to aid in his investigation of the crime. "When the Martian Manhunter, assisted by his interdimensional tiny sidekick Zook, lived his adventures in the back pages of Detective Comics first, and house of Mystery afterwards. When the great Joe Certa illustrated Jack Miller´s scripts..."
I've never been good at anniversaries. 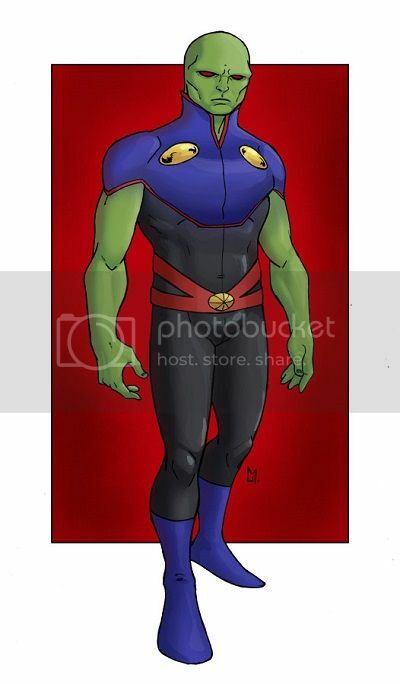 This blog started in 2007, two years after J'onn J'onzz's fiftieth birthday. 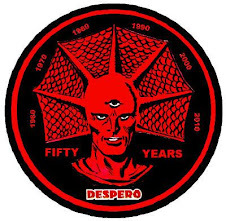 I missed Despero's by only a few days, but failed to acknowledge that landmark for Diane Meade, B'rett, and Professor Arnold Hugo at all. Mongul hit 30 in 2010, but I'd already covered his increasingly thin connection to the Manhunter to death in 2009. Ma'alefa'ak turned 10 and 15 on my watch, but I guess last year's Malefic March Madness and the overall villain theme of 2013 were all that could be mustered for the evil twin. 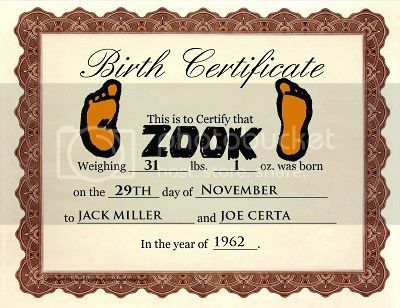 I did try to treat 2012 as a Happy Zook Year, but his hitting the half century mark on November 29, 1962 was forgotten in favor of a feature on Triumph. So, my apologies to the Martian Manhunter's adorable sidekick, and my hopes that this January theme month helped make up for all that neglect. At least I didn't move to the Mediterranean without leaving a forwarding address. The Mancave? Cavehunter from Mars? Do You Know The Way To Middletown? Bad Men Me No Like!